We got up around 9:30, showered and went to breakfast, this time getting breakfast free (or at least as a part of the cost of the room). After breakfast we went back to the room briefly, then headed out. Tip: We ate heavy breakfasts–which is unusual for both of us–so we were able to skip lunch every single day of the trip. We saved quite a bit of money this way. 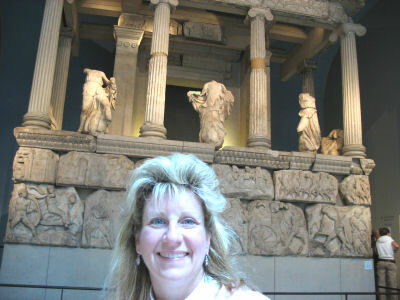 Susan was very interested in visiting the British Museum as she is fascinated by ancient Egypt and mummies. We decided to walk to the museum from our hotel, which turned out to be probably the longest walk we took during our entire vacation. Perhaps there was a bus we could have taken had we known bus schedules, but the walk did us good. I guess it took us about 30 minutes to get there from our hotel. Walking around London is not a bad thing, since everywhere you look is an interesting building, statue or other historic artifact. Just use caution when crossing the streets if you aren’t used to cars driving on the left side of the road. Apparently tourists get hit pretty regularly because they look the wrong way when crossing. If you look down on the road, you’ll see painted words and arrows telling you which way to look. The museum is located on Great Russell Street near the Holburn tube station and the Tottenham Court Rd. tube station, in case you want to get there by subway. The museum is open daily from 10 a.m. to 5:30 p.m. On Thursday and Friday some of the galleries are open until 8:30 p.m. 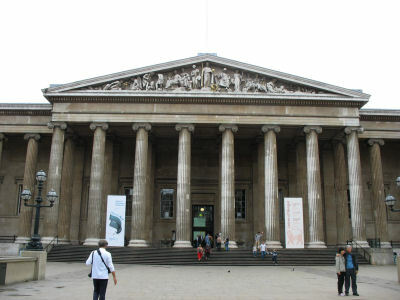 The British Museum is free and donations are gladly accepted. There may be a small charge for some temporary exhibits. Photography is permitted inside so you can get shots of many amazing and famous antiquities. 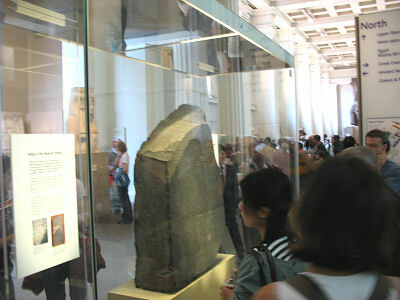 For example as you first walk in, the Rosetta Stone is prominently displayed. The museum is massive, covering many floors and many acres. Facilities for handicapped individuals were present making it easy for most anyone to get around the museum. You might want to purchase a map of the museum so that you can carefully plan out where you want to go and what you want to see. It would be easy to miss certain sections if you didn’t have a map. The map we purchased was 2 pounds. The number and significance of the antiquities on display in the museum is impressive. I couldn’t help but wonder how many countries would like to have these antiquities back. For example, much of the carvings and statues that adorned the Parthenon are now on display in the British Museum. Many Egyptian statues and carvings are also on display. Sections of the museum are geographically based, so you see antiquities from a specific part of the world when you enter a section of the museum. We spent probably two hours working our way through the museum and we finally decided to take a break. 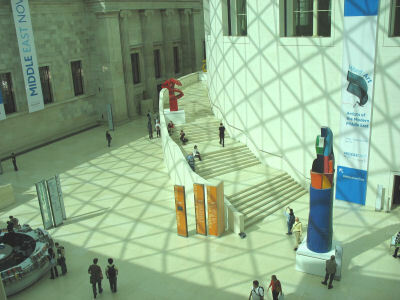 The central hall, called the Great Court, is a massive open area with windows on the roof that allow natural light to illuminate the room. While it had been cloudy and rainy all day yesterday, the sun was now shining through (and would shine brightly for the rest of our trip). In the Great Court are a couple places to get snacks or lunch and drinks. Susan brought some peanuts with her so we just purchased a drink and sat at one of the tables and ate the peanuts. Tip: bring some snacks from home, and save some money. After taking a break and getting a snack, we stopped in the gift shop that is in the Great Court. They have many different items that are related to the artifacts within the museum, so you can take home a fun memory. We didn’t need any miniature mummies, so we left the shop and continued our tour. The museum attracts large numbers of visitors, but because of its size most of the time we were able to easily see the items on display. 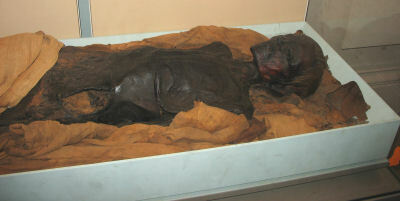 Some of the Egyptian mummies were in very small rooms and they became crowded. We spent a bit more time in the museum and in the gift shop near the exit. Total time in the museum was probably about three hours.